Here's some visuals for the latest Spring 2013 Playlist via YouTube. It's always interesting to see what's available online to illustrate the list -- official videos, ones with lyrics provided for instant sing alongs, and live performances from the professional publicity events to fan filmed (check out the one of Toro y Moi in Moscow!) Cayucas' video for "High School Lover" was already featured on an earlier blog post but in context with the others it takes on another life. And The Shout Out Louds have posted a video with snippets of their entire CD, so take a listen to it all or find the song "Circles" at 8:50. The groundhog predictions were just plain wrong this year as snow stayed in the forecast, along with the cold weather, through the first day of spring. 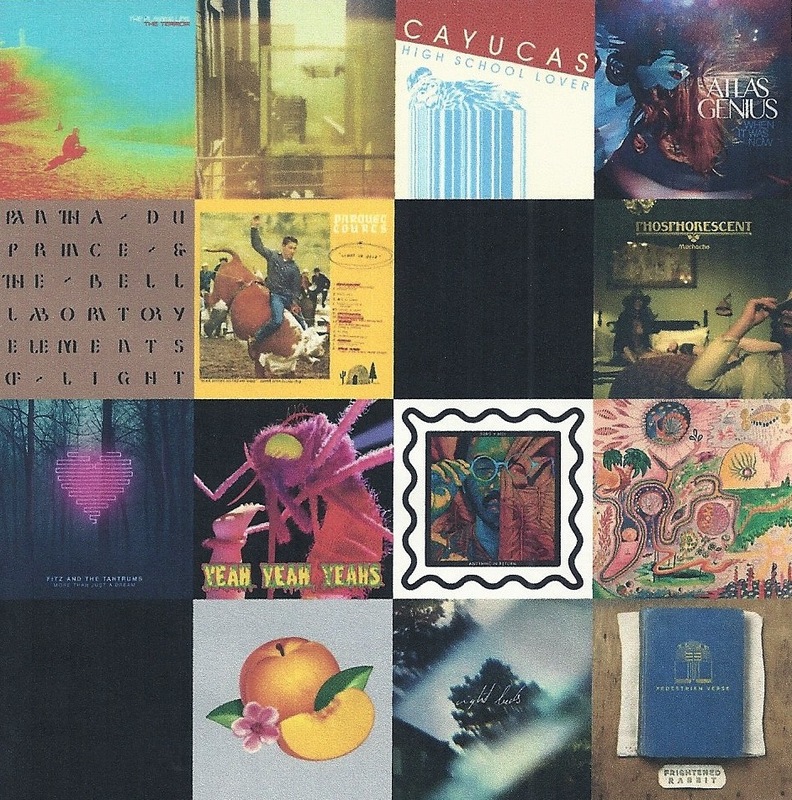 At least there was plenty of new music to dig through with new albums by Toro y Moi, Frightened Rabbit, Phosphorescent, and Youth Lagoon, to spice up the continuum of life indoors. 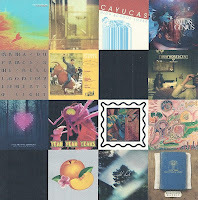 Teaser singles from upcoming albums featuring The Flaming Lips, Fitz and The Tantrums, and Phoenix also kept music fans longing for spring, while new bands Parquet Courts, Cayucos and Painted Palms reinforced the seasonal theme of renewal. Link to listen here. Oklahoma’s own house band, The Flaming Lips, keep the party going with this latest psych rock experiment, which debuted on the Super Bowl as a Hyundai ad. This single provides a blast of fun from the upcoming thirteenth studio album, The Terror. Chaz Bundwick of Toro y Moi decided to indulge in R&B and 90s house music influences for his third album, Anything In Return. His smooth delivery still gives off the chillwave vibe he’s known for, even in this varied context. This Santa Monica based quartet knows firsthand about that sunny California mindset pervading their music, layering their pop tunes with ambient party noise and other samples to keep things interesting. “High School Lover” is a tale of unrequited teenage love from their upcoming debut album, Bigfoot. Fitz and The Tantrums are back after their retro sound and constant touring caught the ear of many new fans. This single from their sophomore album, More Than Just a Dream, expands the sound to incorporate 80s synths while threatening to bury Fitz’s stellar blue-eyed soul voice. Brooklyn based band Parquet Courts brings a resurgence of punk attitude in their debut album, Light Up Gold. Inspired by the NYC bands before them, the quartet charges through songs with a no holds barred approach to vocals and raucous rock performance. West Palm Beach alt rock quartet Surfer Blood is getting ready to release their sophomore album, Pythons. Singer John Paul Pitts lets loose in a yelping chorus, describing the song as an individual's manic episode (which unfortunately might remind fans of the domestic battery charges filed against him last year). Swedish indie pop quintet Shout Out Louds return to the music scene with their fourth album, Optica. The instrumental crunch of synths introduce this dreamy tune set in a 80s dance groove. Singer/guitarist Scott Hutchinson is responsible for yet another heart on the sleeve story highlighting his honest, earthy delivery. The Scottish indie rock quartet recently released their fourth studio album, Pedestrian Verse. Alabama native Matthew Houck, now based in Brooklyn, has been recording under the name Phosphorescent since 2001. This song is from his fifth album of indie folk infused with a rock music sensibility, Muchacho. French alt rock quartet Phoenix is returning since 2009’s breakout Wolfgang Amadeus Phoenix with album number five, Bankrupt! After an Asian influenced intro, singer Thomas Mars commands another signature soaring chorus, instantly reminding fans of the band’s appeal. 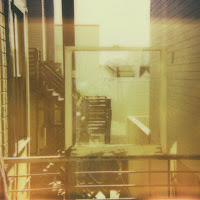 San Francisco based duo Painted Palms released this track as part of a preview for their upcoming debut album, Carousel. The tune crafts an indie pop treatment of introspective, interwoven vocals over a percussive foundation. Idahoan Trevor Powers of Youth Lagoon branches out from personal shoegazing to low-fi conceptualizations of metaphysical musings, along with some ascribed pop music influences. 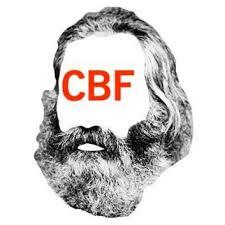 This floating meditation is from his sophomore album, Wondrous Bughouse. Australian indie rock quartet Atlas Genius creates tightly formed pop songs with an infectious vengeance. This catchy single is a solid introduction to their debut album, Through the Glass. Alt rock trio Yeah Yeah Yeahs have served as a point of pride for New York City since 2000. This single from their fourth studio album, Mosquito, adds a gospel choir as the only really appropriate background singers for the majestic voice of singer Karen O.
German electronic music producer Hendrick Weber, a.k.a. Pantha du Prince, has teamed up with Norwegian percussion group The Bell Laboratory to layer chiming bells over his synth universe. The resulting collaboration is Weber’s fourth studio album under this moniker, Elements of Light. 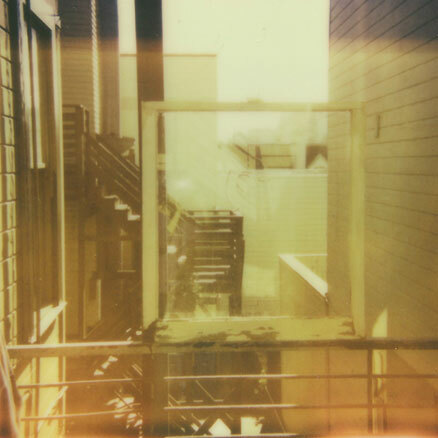 23-year-old Nashville native Winston Yelten writes spare songs late at night and it shows. This is the first tune he wrote (at age 18) as Night Beds, dealing with the bittersweet realization that a relationship would soon end. 4. ATLAS GENIUS -- THREE OF THEM!!! 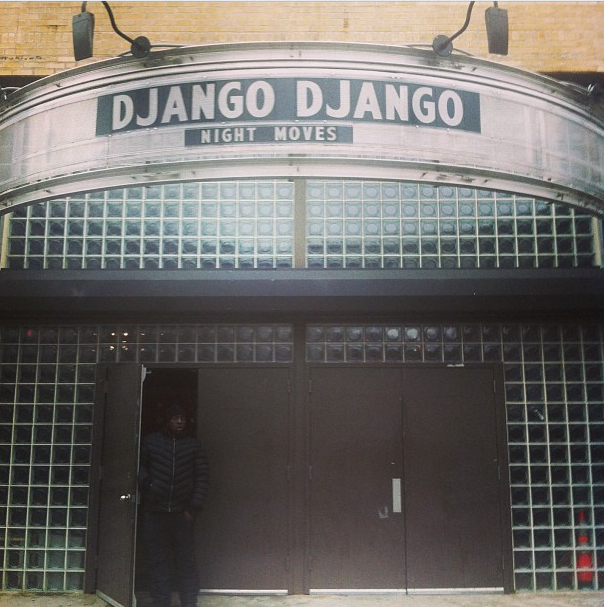 A new indie music and film festival was welcomed to the NYC scene last spring at the Brooklyn Academy Of Music (BAM) called Crossing Brooklyn Ferry. Curated by Bryce and Aaron Dessner of the Brooklyn band The National, the three-day event brought together many like-minded fans who could easily crisscross between sets within three interior spaces of the Peter J. Sharp building. I've been waiting for the announcement about this year's lineup while The National seemed to appear on the bill of so many other festivals through the summer, even a date at the nearby Barclays Center June 5. With a new album on the way, the Dessner brothers have been even busier than usual (and Bryce Dessner will be performing "The Planetarium" at BAM March 21 - 24) but still it took until last week to release the details. So the second annual Crossing Brooklyn Ferry will take place April 25 - 27, with headliners The Roots, Solange, and TV on the Radio. Other noteworthy acts include Eleanor Friedberger, Here We Go Magic and Higgins Waterproof Black Magic Band, which is a side project of TV on the Radio's singer Tunde Adebimpe. The Brooklyn Youth Chorus will make repeat appearance, perhaps with a new piece written by Bryce Dessner, who accompanied them on guitar last year. The BAM café will again be serving up sustenance in the form of snacks and drinks throughout the night, as well as the opportunity for chance encounters with performers such as my run in with David Byrne last year. To cap things off, there's also plans for another late night dance party on Saturday night from midnight to 3 am. Tickets are a very reasonable $50 per night or a full festival pass for $120. For further info and tickets visit BAM's dedicated website crossingbrooklynferry.com. New band Cayucas has a busy schedule at SXSW this week after joining blog fave Ra Ra Riot for a West Coast tour. Their song "Cayucas" was KEXP song of the day a while back and I've also been hearing "High School Lover" on the airways. Both are gem-like indie pop tunes, with a sunny California vibe that is actually true to their roots (the name and song refers to a place on the coast midway between L.A. and San Jose). "High School Lover" has all of my favorite pop song elements: shout outs, a sing along chorus and funky groove. The story revolves around a girl who used to write letters to band leader Zach Yudin, who never responded in typical teenage fashion, even though he liked her back.Their video even shows the band playing their instruments (as discussed before, my favorite kind of visual) and is adorably animated with a sweet ending that concludes with a couple dancing. It's directed by Cameron Dutra in a "live-action stop motion"effect he developed, and features lead singer Zach Yudin with twin brother Ben on bass, along with Banah Winn on keys and drummer Casey Wojtalewicz. 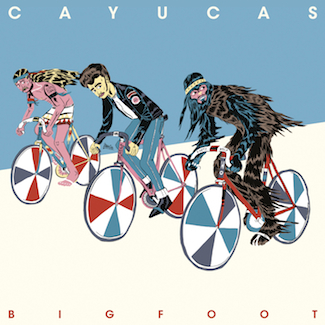 Their debut album Bigfoot will be out April 30 via Secretly Canadian, but a preorder is available through SC Distribution. A $19.99 bundle offers an instant download, poster of the album artwork here and appropriately enough, a beach ball with a Cayucas logo. DJ Moon (a.k.a. 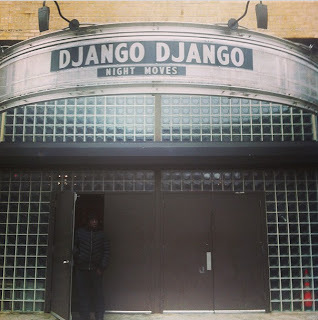 James Murphy's Nephew) Releases EP "Day/Night"
connections (and while still in college too, I know because in a small world happenstance my son Jake caught a set while visiting a friend up in Boston). I'd say snap him up! Check out the songs at link from the fb post embedded below or directly here. On the band website musicofthemoon.com is a mission statement that sounds a similar LCD "I was there" mantra. Stephen writes "I am an electronic musician from Boston. I make music I want to listen to. You might like it too." ok, my (james') nephew stephen (aka M|O|O|N) who i've mentioned here before, has made another EP, and i've just heard it. it's his best, and i really love it, so i'm just sharing it here, being kind of a proud uncle--possibly most proud of the fact that i only hear this stuff when he's done, and that he self releases and never asks me to put it out on DFA, which is pretty ballsy, if you ask me. Not everyone is heading to Austin this week for South by Southwest (SXSW) even if it sometimes feels like it. So thankfully, there's plenty of online offerings to take advantage of just by being near a computer. 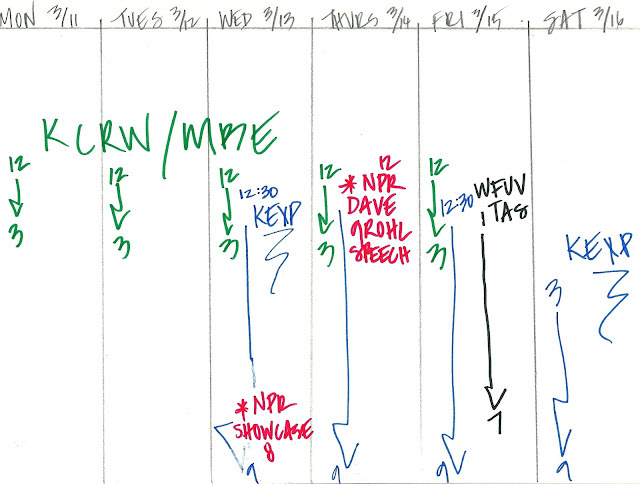 After perusing my favorite new music outlets, I had to draw up a schedule similar to what I used to do in college diagramming my classes (see below). It's going to make for a busy week! For starters, SPIN has picked forty bands as "Must See Acts" as readers can flip through a listing of buzzed about bands even before the buzz begins. Each group has some background info as "The Skinny" and then some props under a section called "Why You Should Care." Big names such as Vampire Weekend and the Yeah Yeah Yeahs are found here, along with blog faves Foxygen and Major Lazor. Two new bands that have recently caught my ear are also given a shout out: Parquet Courts and Chvrches. Even The Hollywood Reporter's website is writing about "5 Buzzworthy Bands" (Alt-J, Atlas Genuis and Haim plus others) along side quirky articles such as "How to Sleep Like Oprah and Eat Like a Local" and coverage highlighting the film component. Another great preview is NPR Music's The Austin 100: A SXSW Mix, available as a download through April 5. There is over six hours of songs here, with many proud moments as I spotted blog faves Caveman, Youth Lagoon, and Foxygen on the list. Nothing new really struck me, but my musical tastes were certainly reinforced towards the indie tilt (no need for Killer Mike or Skeletonwitch, thankyouverymuch). NPR will also live broadcast a showcase on Wednesday, March 13 at approximately 8 pm EST, featuring theYeah Yeah Yeahs, Nick Cave & The Bad Seeds, Youth Lagoon and others. And on Thursday, March 14 at 12 noon, NPR will broadcast Dave Grohl's Keynote Speech, surely an entertaining listening session. LA's KCRW brags how it was one of the first radio stations to broadcast remotely from the festival and this year "Morning Becomes Eclectic" will be there Monday through Friday (12 pm to 3 pm EST). Musical Director Jason Bentley will be interviewing Depeche Mode and the station will host an official showcase Wednesday night with Ra Ra Riot, Wild Belle, Atlas Genius and Toro Y Moi. KEXP plans to be broadcasting live Wednesday through Friday (12:30 pm to 9 pm EST) as well as Saturday (3 pm to 9 pm EST). Among the bands for exclusive live sets are Iron and Wine, Parquet Courts and Billy Bragg. A full schedule is available on their blog at the link at the beginning of the paragraph. Five public radio stations are presenting a showcase on Friday called "Public Radio Rocks" (including a local, WFUV's The Alternate Side). From 1 pm to 7 pm, a full lineup from Divine Fits to Iron & Wine and Vampire Weekend will be broadcast live on those stations. It'll be a proud day both online and over the airwaves. tour along the way to SXSW, so with the pride of an early adopter I watched them wow the crowd. 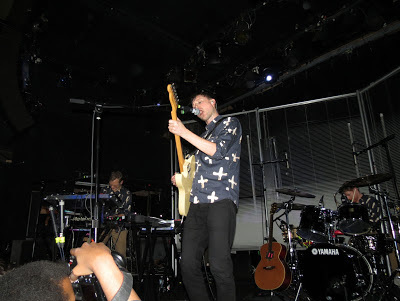 The U.K. band played their crazy-catchy indie pop tunes with an appropriate amped up energy to get the place hopping. (Literally, there was lots of 80s style pogo sticking going on!) The constant strobe lights made capturing the concert visually quite a challenge, but it's that shared experience on site that's still the most important thing. Official write up for PopMatters is here, plus extra photos and videos below. 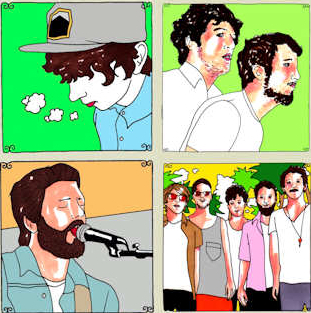 Mr Daytrotter has also rolled out a Coachella 2013 Playlist, with the entire lineup represented in past Daytrotter sessions. The festival is planned over two weekends to capitalize on the crowds, April 12 - 14 and April 19 - 21 (info at Coachella.com). There's recent blog mentions Youth Lagoon and Beach House, along with established faves such as Vampire Weekend and Portugal. The Man. Of course, some groups overlap with Daytrotter's Bonnaroo 2013 Playlist, reflecting the busy touring schedules of Grizzly Bear, Wild Nothing, The Lumineers, Tame Impala and others. Check out the sleepy sounds of the already buzzed about Jake Bugg and an alarmingly stripped down version of Two Door Cinema Club's "Something Good Can Work." As always, there's plenty more where all this comes from by visiting individual artists' sessions in the archives -- just pony up that $2 a month subscription fee.